With the Galaxy J and Galaxy A series, Samsung has offered solid smartphones for every price range in recent years. Now the South Korean company is bringing more structure to the A-Class than it seemed at first glance and wants to make it easier for users to find the right smartphone. It can seem confusing at first glance: Samsung presented the Galaxy A30 and Galaxy A50 at the MWC. Shortly afterwards the Galaxy A10 was presented in India and then also a Galaxy A70. The whole thing was followed by today's presentation of the Galaxy A80, which we could already try out. Does Samsung now make the mistake several other manufacturers have made before and flood the market with too many devices? No, because Samsung's strategy behind it is more sophisticated than it seems at first. The J-Series is dead, long live the A-Class! Let's start at the bottom, in the entry-level class. Because here Samsung is dropping the popular J-series - but not without replacement. Because this is where the A-class in the form of the Galaxy A20e and Galaxy A10 steps in to take its place for the budget-conscious. However, the latter is not yet planned for Europe. Like the Galaxy S10e, the Galaxy A20e is designed for users who want a handier smartphone. 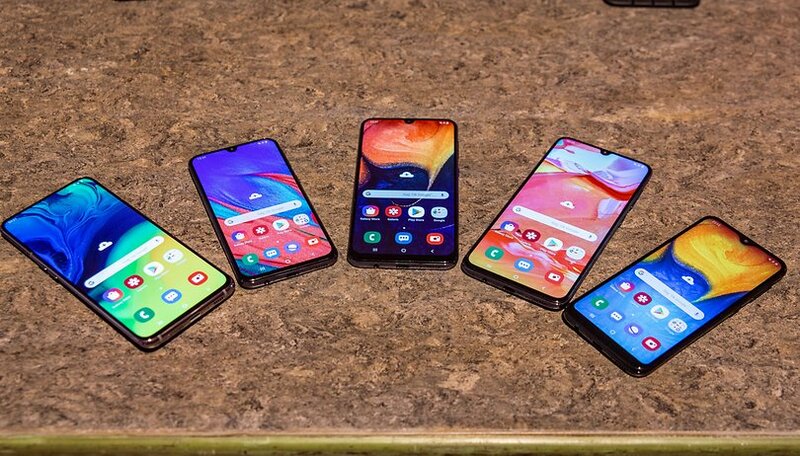 Next come the Galaxy A40 (or the A30 in some countries) and Galaxy A50, which follow in the footsteps of the Galaxy A3 and A5, but have grown considerably with a 5.9 and 6.4 inch display respectively. At the upper end of the A-series there are the Galaxy A70 and A80, which offer a better camera and more performance at a higher price. The first digit therefore stands for the price range, which, although we received the information for it classified in euro terms, will follow the same pattern all over the world: the cheapest devices will start with two up to the more expensive handsets starting with the number eight. All other model numbers are somewhere in between. The second digit stands for the generation of devices, starting with zero for 2019. Buyers of the Galaxy A80 therefore have the most expensive model of the series from 2019. Its successor will be Galaxy A81 in the coming year and Galaxy A82 in 2021, etc. Of course, the mere confusion of names is not enough, because for the end customer it does not become clearer per se. But Samsung has also thought about that and will offer a special Smartphone Finder on its own homepage. Here customers can decide how much they want to spend, which features are important to them and what they want to do with their smartphone. Depending on the user's specifications, Samsung then suggests the appropriate device. The focus of all new models in the A series is on four pillars: there's the Infinity display with as little edge around it as possible, so that the group Samsung refers to as "Screenagers" can enjoy media content perfectly. In addition, there is a slim and modern design, a good camera - corresponding to the respective price segment and reliable performance in terms of performance and battery life. And, of course, the announced strategy of "trying out" new features in the A series remains whether they are suitable for the Galaxy S series. What do you think of Samsung's new strategy? Can the manufacturer stand out better in the highly competitive middle class?